µm scale bar) and fig. 5b, which has its own bar. Figs. 1-3, 5. Lophophaena witjazii, with detail of tangential radial needles lining the margin of cephalic pores in fig. 5b. Note that the distal ends of larger spines are also adorned in a similar fashion. All BSS: 28B(II), 19B(F) EF Z33 and 2x 28B(II). Fig. 4. Lophophaenoma sp. sensu Petrushevskaya, 1971. BSS 28B(II). Fig. 6. Tripospyris tricostata BSS 49B(F) EF X37. Dorsal view. Figs. 7, 8. Lophophaena araneosa. IOW 188(F) and BSS 28B(III/356). Figs. 9, 10. 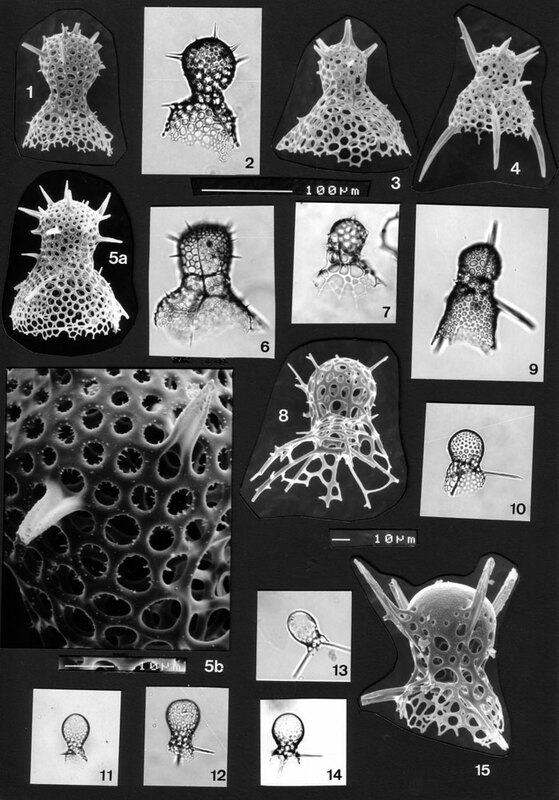 Peromelissa thoracites. BSS 38B(F), EF A47 and BSS 19B(F) EF Y44. Figs. 11-14. Peromelissa phalacra, showing variability of cephalic outline and porosity. BSS 32B(F), 19B(F) EF S51, 143B(F) EF 038 and IOW 188(F). Fig. 15. Peromelissa decacantha. BSS 28B(III/391). Cp. with Pseudocubus obeliscus, Pl. 60 figs. 3-6.